Tomorrow is Halloween, so I thought this week’s mystery fossil is particularly appropriate. Herman Diaz was able to guess that it was some sort of bovid, something along the lines of a bison. Were you able to get any closer? This picture is indeed a bovid, although it’s not a bison. 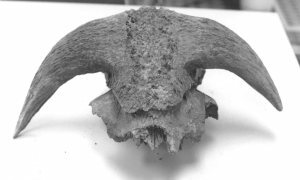 The skull cap, adorned with horns is from an animal called Bootherium bombifrons, also known as Harlan’s muskox, , woodland muskox, bonnet-headed muskox, or my personal preferred term second to the great Bootherium, the helmeted muskox. 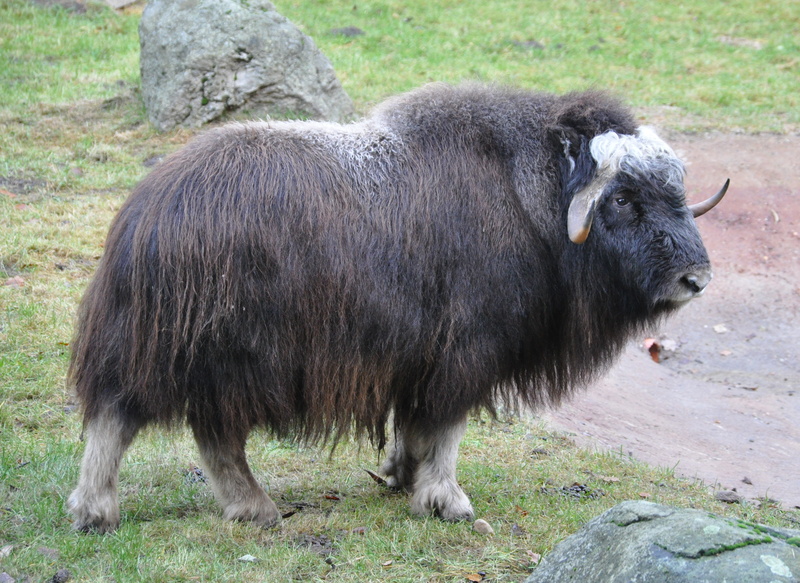 Muskox are ungulates (hoofed animals) in the order Artiodactylia, even-toed ungulates such as pigs, deer, camels, and antelopes. Artiodactyls also include hippos and whales, which is why some people prefer the term Cetartiodactylia. Bovids are a group of artiodactyls known for having blunt snouts and unbranched horns. In addition to the ever-popular cows, they include bison, sheep, goats, antelopes, and of course, the muskox. It is a large group, with over 400 known species. Muskox today consist of a single species, Ovibos moschatus. Muskox are commonly misunderstood to be related to oxen, which are really just cows (or more correctly, cattle, as cow technically only refers to females) that have been trained as draft animals and not a separate species at all. Muskox are really more closely related to goats than cattle. They are adapted for cold weather and live in Arctic regions of North America, Eurasia, and Greenland. Bootherium, unlike its modern cousin, lived in more temperate climates. It lived throughout North America during the Pleistocene Epoch between 300,000 and 1.8 million years ago, but was most common in the southern United States. It is not a common fossil in Arkansas, but has been identified from Newton County in the northern part of the state along the Buffalo National River. Sadly, the paper referencing this find is chiefly about a cave in Maryland from 1938, which is a great indicator of a lack of decent mammalian paleontological research in Arkansas. Nevertheless, during the Pleistocene, Bootherium has been listed as the most common form of muskox in North America. 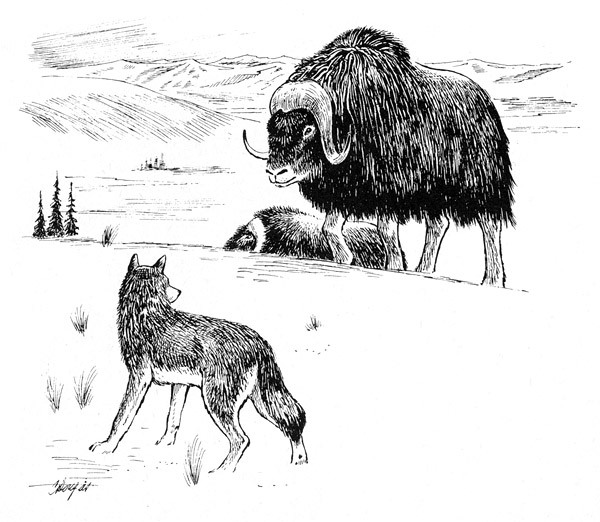 Bootherium is reported to have been taller and thinner than modern muskox, with a finer and shorter fur coat, as befitting the warmer climate. They also had large horns that were fused together across the top of the skull. Considering that it shared a similar habitat with mastodons, which we have in a fair abundance within the state, it would be expected that there should be more evidence of them being in Arkansas. It may be that they are usually mistaken for the bones of modern cattle, which are not uncommon throughout the state. So perhaps there are more around here than we know about. For more information on Bootherium, check out the website of the Yukon Beringia Interpretive Centre. By paleoaerie in Fossils of Arkansas, Paleontology on October 30, 2015 .